After appearing in various forms of sketches, eventually the original figure of 2013 Toyota Corolla Altis successfully immortalized by CarandDriver. It looks more elegant with light slimmer adopted from the latest Camry. Grille design changed by using a 4 layer that was previously only one in the middle of a rather large size. Including bumper that turns on the air dam and fog lamps on more sporty. In addition, line and curve of the body seem more rigid, thus giving the impression of more compact dimensions. Most obviously, the longitudinal grooves in the side from front to back parallel to the door opening lever. The end of the rear window is no longer straight but broken. The most extreme change rear lamps with sharp angles asymmetrical shape. Reportedly, the interior space is very strong feel of luxury such as the Camry. The use of LCD display for climate control air conditioning information and wood accents. Navigation systems and operating controls on the steering wheel also changed the style of the Camry. This display changes to match changes that allegedly carried out the latest Honda Civic. 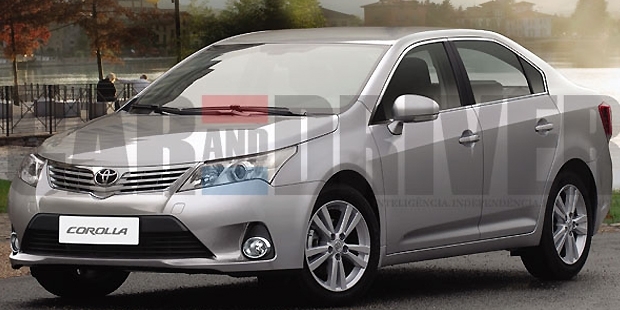 But there are some circles who assess, design is an absolute adoption of the Avensis.